After last week’s blog you are nearly ready to begin manifesting the life of your dreams. But there’s one more important step that must before that can happen in my experience. It has to do with nourishing your spirit. Believe me, you don’t have to go by some spiritual or religious faith to master the art of manifestation. But in light of the amazing truths that I have written about and that science has revealed to us, I can’t imagine that you aren’t sensing that there is a deeper dimension and consciousness to life. To me, it takes the form of the sense I have that everything is interconnected. Here, I use the term “spiritual” to describe this sense of existence, but really you can use any term you’re comfortable with. The key point of information I want you to take away from this is how important it is to nourish this part of yourself if you want to raise your frequency. So how do you go about doing this? Well one simple practice I find very helpful for nourishing and aligning myself on a spiritual level is daily journaling. In fact, for most of my life, I have kept a journal. Having done that, I realize how valuable it is to have a record of my life that I can periodically look back over and reflect on the things that I struggled with and overcame, along with my many blessings. Even now, I try to take a quiet time every morning to write in my journal. Don’t worry, if I can do it anyone can. In fact, my approach is very simple. It has three steps, beginning with gratitude and ending with love. Express Gratitude. I start by thanking God or the Universe for all the things in my life that I am grateful for. Gratitude opens the heart and connects you to the energy of love and abundance. Ask for Wisdom. I believe that there is a field of energy and intelligence in the Universe that can help me to find guidance in my life. I ask for wisdom in navigating whatever choices, challenges, or dilemmas face me. 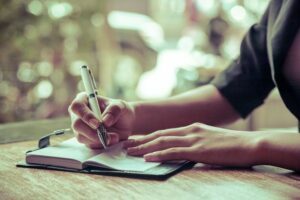 Writing down each specific situation helps to invite the wisdom in and focus the energy of the Universe onto that particular issue. Offer Love. I end with offering thanks and love to the power and energy that connects us all. Of course, some days my entries are short; some days they are long. In all, I spend about ten minutes journaling each day, followed by about five minutes just sitting and being quiet. By doing this simple practice, I have found that it keeps me connected with my own spiritual nature and with the greater spiritual reality that I am a part of. Try it, it just might trigger the Creator inside you to start manifesting the life you really want! Mike Murphy is bestselling author, speaker, coach and consultant committed to helping people around the world manifest their deepest dreams. He is also the author and creator of the The Creation Frequency, a project that distills the best lessons he’s learned, over 30-years of trial and error, into an easy-to-use online course and book.Over the past 3 decades Mike’s used the practices of The Creation Frequency to manifest multiple business enterprises, generate millions of dollars of revenue, create good works and help others live healthier better lives. Today his life is devoted in loving contribution to serving not only those who are struggling with illness or addiction, but also those who know deep inside that there is more to life.